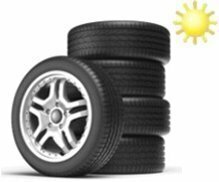 The team at tyres-guru.co.uk does not just want to provide you with high-quality summer tyres that perform extremely well on both wet and dry roads. If you are interested in complete wheels for your vehicle, you should also check out our alloy wheels with summer tyres. Of course, these complete wheel packages are not just offered for regular passenger cars. Instead you can shop alloy wheels and summer tyres for SUVs, trucks, vans, commercial vehicles, and offroaders as well. We will be sure to deliver your complete wheels as soon as we can. Mainland UK delivery is free of charge, which means even bigger savings for you. No matter whether you are shopping for alloy wheels with winter, all-season, or summer tyres, choosing the right tyre size and profile is crucial. Please use our vehicle selection tool so that we can suggest the right tyres. We also work with fitting stations across the UK to be able to offer you an affordable tyre change near you. Feel free to take advantage of this useful service and have your alloy wheels and tyres delivered straight to the respective fitting station. If there are any delays, we will be sure to let you know. This is our customer service promise to you!